Boston Mayor Martin Walsh and Boston Police Commissioner William Gross announced Tuesday the recipients of the Boston Police Department’s $500,000 Youth Development Fund. There are 20 organizations that will each receive $25,000 to help give Boston’s young people the opportunities to be successful, according to a press release from Walsh’s office. The YDF’s funding for this year is double the total of last year. Walsh said in the release that education, development programs and safe environments help give young people the opportunities they need. “The Boston Police are a major partner in this, and I’m proud that today we’re able to fund 20 great organizations that will make a lasting difference in the lives of Boston’s youth for years to come,” Walsh said. City Council President Andrea Campbell wrote in an email that several young people involved in programs that receiving YDF funding testified at a Council hearing. They said that without these programs, they might be dead or incarcerated. “The jobs, skills, and relationships young people build through these programs are critical to breaking cycles of inequity, especially for young people of color, and ensuring they reach their God-given potentials,” Campbell wrote. Kate Morneault, 24, of South Boston, volunteers at local high schools and said she thinks it is important to provide the city’s youth with adequate resources. Stephanie Berkowitz is the director of external relations for the Center for Teen Empowerment, one of the groups receiving money from the YDF. Berkowitz said the organization employs and trains young adults aged 14 to 21 in Dorchester and Roxbury by collaborating with older adults to solve issues that exist in their community. “Part of our work is involving young people and youth voices, really, in the public policy process, trying to get youth voices into the rooms when officials are making decisions,” Berkowitz said. BalletRox, an organization receiving funding from the YDF, teaches dance classes to students in Boston Public Schools. Carol Knox, executive director of BalletRox, said the group will use its funding to pay the five instructors in their community dance program. Youth organization All Dorchester Sports and Leadership, which uses athletics to foster teamwork and equality, is also receiving funding. ADSL Executive Director Candice Gartley said the group will use the funds its given for staffing. 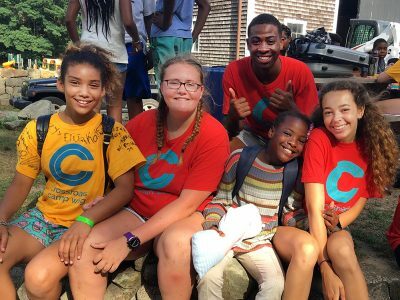 Alex Cuprinski, communications director of Crossroads — another group receiving funding — wrote in an email that the organization’s C5 Leaders five-year program aids middle and high school students from underserved communities. The funding will be allocated to fund a weekend C5 event, community service opportunities and a 25-day summer leadership camp, Cupriski wrote. Sheila Belot, 43, of Hyde Park, said she recognized the importance of the donations, as they provide an opportunity for Boston youth to develop lives as upstanding citizens. Julia Sullivan contributed to the reporting of this article.